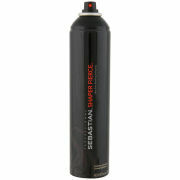 Sebastian Shaper Zero Gravity is a flexible hold hairspray ideal for fine hair. This lightweight, completely brushable finishing spray offers a supple hold which is ideal for prepping the hair during styling or creating bouncy, floaty hair styles. Suitable for all hair types, this dry control spray liberates fine, limp hair and delivers delicate movement and invisible hold. Shaper Zero Gravity can be layered for extra hold and flexibility and has a quick drying formula which feels weightless on the hair.